Easter 2017 is from Friday 14 - Monday 17 April. Good Friday (the 14th) is a bank holiday but not a public holiday in the Republic of Ireland: most public-transport run normal services, with a few exceptions. However all pubs, hotel bars and off-licenses are closed, all banks and many publc services (eg post-office) are closed, and some other companies treat the day as a "bank holiday". 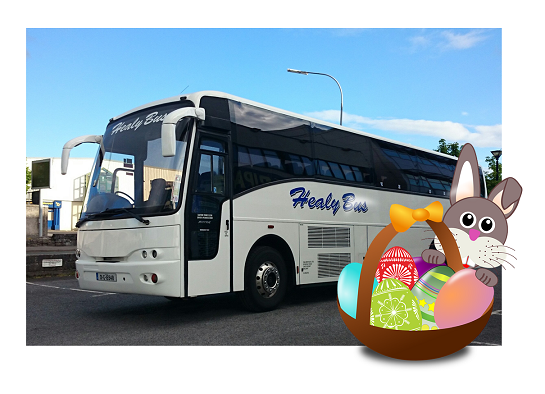 Easter Monday is a public holiday, and in most cases Sunday services will be run. Information from specific bus and train companies is summarised below. Always confirm details with the company. Bus Eireann services did not run during the three weeks leading up to Easter due to the bus-drivers being on strike. Services started running again in some cities on Thursday afternoon, and are expected to be close to normal on Friday - but there may be some operational issues still. Good Friday: Normal Saturday services on routes 411 during the daytime: First bus from Cappagh Rd at 7am. Last bus leaves Eyre Square at 6:45pm. No services on route 412 or 414. Easter Sunday and Monday: Normal Sunday service. Some reduced services during Easter weekend. Details are available here. Regular Friday services on Good Friday - except for the NightLink service that did not run. NightLink on both Saturday and Sunday nights. The 7:45am Loughrea - Galway will not run between 6-14 April. The 9pm Galway - Loughrea ceases on 6th April, and will not run again until September. Easter Monday - Reduced service: One bus from Birr at 7:45pm. See their website for more details. Have not issued information about their Easter timetables. Check with individual companies for details. There are major changes to train services in Dublin over the Easter weekend, due to maintenance work being done. People travelling to/from Dublin may have bus-transfers at the Dublin end of their journey. Good Friday: Galway trains on a Friday timetable with some alterations. 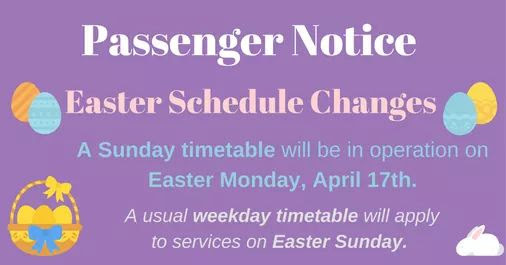 Easter Monday: Galway trains rill run to a Monday timetable but with a significant number of alterations.